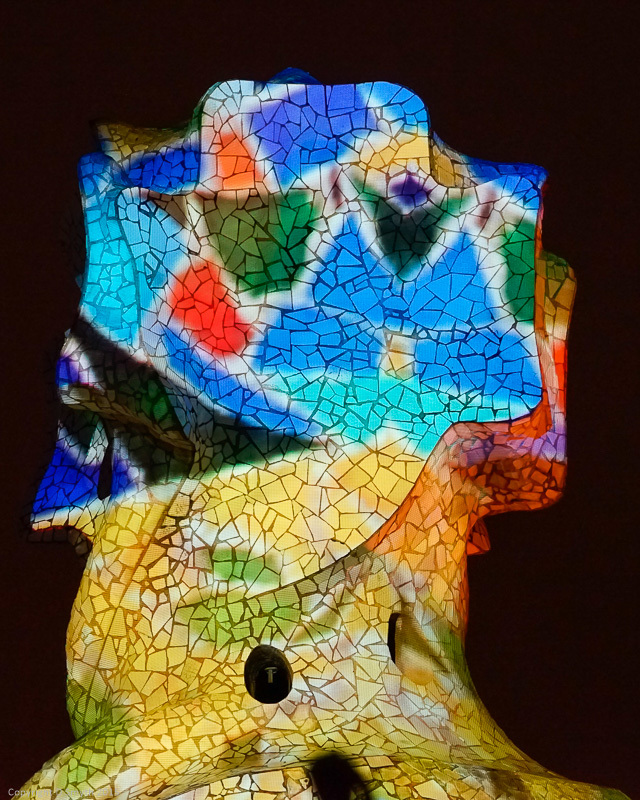 This summer, you can join an unusual night tour of La Pedrera. Known as The Origins, this tour spends some time in the vaulted laundry area, beneath the roof terrace, where you can learn about the structure of Gaudi’s building and see some of the furniture that he designed for it. After that you make your way up to the roof for a spectacular sound and light show, with vivid images projected onto the chimneys; flowers, frogs, butterflies and flames all feature. I was up there on a very wet night in May – they provided us with umbrellas but it was tricky to take photos while hanging onto the umbrella, and the steps get pretty slippery in the wet. Hopefully you’ll be luckier with the weather. As I was there off-season it wasn’t at all busy, but in summer I would suggest pre-booking online. Linked to My Sunday Photo. I do love a bit of Gaudi. We went round La Pedrera many years ago and I remember revelling in the weirdness of the rooftop sculptures in particular. What a unique and talented artist he was! Looks so amazing! I can already imagine how hard it is to take photos especially in a rainy night but they look amazing still! That looks amazing – love all the different light effects. My son is leaving soon for his summer study abroad in Toledo — sharing this post with him for an interesting site to fit into his itinerary on weekends or during his independent travel time! What a wonderful place to be for the summer. Toledo is beautiful and there are many more historic places nearby, plus Madrid of course. He should definitely visit Barcelona if he can, and I love malaga too. Gorgeous colours. Have a happy weekend. This sounds absolutely wonderful! I might have an opportunity in September. Thanks for the tip. I love the way the light shines through…gorgeous! I tempted to go again in better weather!